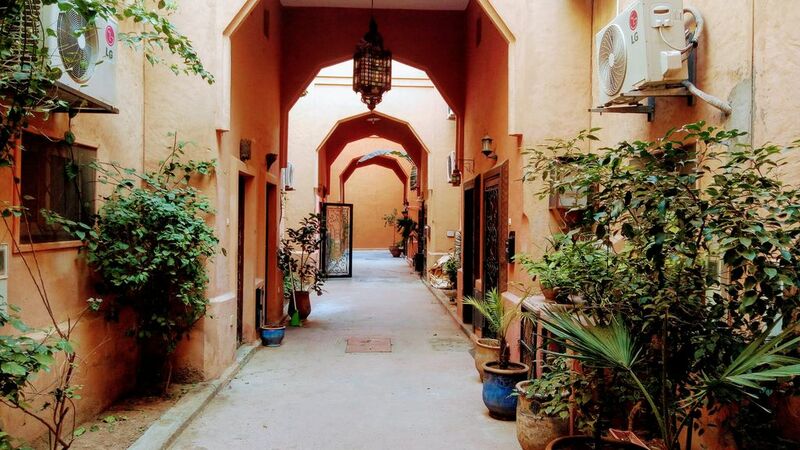 Located in Marrakesh, 1.3 km from Jamaâ El Fna Square, Ansar riad promises to be a haven of peace that combines comfort and modernity with the charm of the East. It has three double bedrooms each with its own bathroom and can accommodate up to six people. On the top floor, you will enjoy a roof terrace to relax, sunbathe or drink a mint tea. And from March to November, refresh yourself in one of the 3 swimming pools offered by the residence. This private accommodation is fully air conditioned and equipped with wifi. Because it is important to be well received when you arrive in a foreign country, the riad Ansar, in addition to its attractive rates (350 to 550 euros per week), offers a Riad airport transfer included in the price if you spend more than 3 nights in our Riad. Because you are on vacation, housework should not be part of your hassle. You commit to leave the Riad in good condition and we take care of cleaning and change of sheets and towels at the end of the rental. This service is included in the rental price. Enjoy this haven of peace close to the medina inside a secure residence 24h / 24h. The pool is also secured with 3 pools (child, teen and adults). The Al Qarya Siyahya Residence in Marrakech has three outdoor swimming pools and essential services to enhance your stay: groceries, restaurants, snacks, pharmacy. The opening hours and rates are similar to what you can find elsewhere in Marrakech.